The main reason for cycling is the convenience, being able to visit a number of places in town in a single trip, not having to worry about train timetables or parking a car. This is a significant time saver, particularly if for example you need to visit several places in town that are not within walking distance (my regular visits include meetings in the centre of town, then back via Sainsburys and Lidl for some food shopping) – time consuming if you are either walking or trying to drive through traffic. One of the main reasons I cycle is for the health benefits, building exercise into my normal day without having to resort to going to the gym. I use an activity tracker to track my weekly ‘intensity minutes’. The NHS guidelines are here. Because I cycle quite quickly with a relatively low level of assistance (i.e. what is defined as ‘vigorous exercise’ ), I achieve about 60% of the weekly recommendation in a single return trip into town, so I exceed the recommendations by more than double in an average week, just from cycling. I am often asked what the range of the bicycle is, and it’s rather like asking how long a piece of string is. It very much depends on the hills you climb, how much assistance you select from the motor and the battery size of your bike. For me I reckon I can cycle in and out of Bath 2 to 3 times (so about 30 miles and 1,000m (3,000ft) of climb in ‘Tour’ mode. If I select a lower level of assistance in ‘Eco’ mode I can stretch this out to about 50 miles. The best way of working out the range is to use the Bosch calculator: https://www.bosch-ebike.com/en/service/range-assistant/?setLanguage=1 which allows you to enter details about yourself, your bicycle, assistance level and type of terrain you are covering, and then provides a good estimate of what you might realistically expect. There is a slight caveat to the range of an ebike – in cold weather the battery loses capacity, up to 30% if the bike is left outside in sub-zero temperature. To get around this I have a neoprene ‘tea cosy’ cover for the battery, and I remove the battery from my bike when parked outside in very cold weather and carry it with me to keep it warm if it’s cold – but this only happens on a few days of the year. Between rail fares and reduced wear on the car I reckon I am saving about £500 per year. 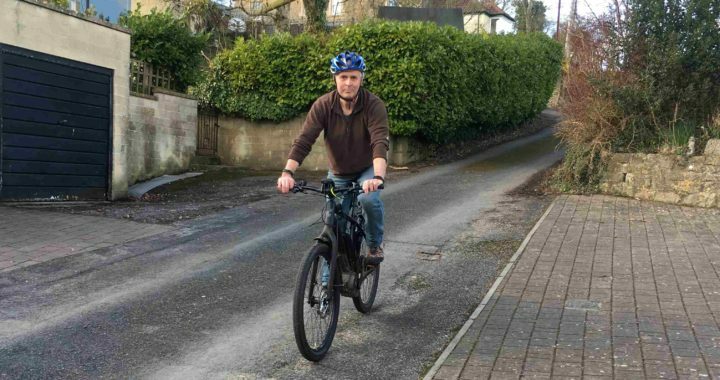 I save about £700 but the electric bike costs about £200 per year to run (2,000 miles at 10p/mile), so on a net basis I save about £500 per year, and get free exercise (no gym membership) thrown in!